the absence of a parent. Here Darin (facing) improves on the do-si-do. THIS IS A NEW KIND OF Monday-morning traffic jam. At the intersection of a balance beam, high wire, and bridge, kids crowd onto a platform atop a telephone pole swaying above central Oregon's high-desert sage and sand. Mersedes, 12 years old and stuck in the middle of the scrum, unhooks one of two carabiners connecting her to a safety cable to let someone by. A minute later she unhooks the other--one of the only no-nos on this ropes course. As long as climbers only disconnect from one safety line at a time, falls are certain to be short. Unclip both, and the first and last stop is hard ground cushioned by bark dust. An instructor sees Mersedes' mistake. Everything stops. She yells not to panic. Clip in, she says. Be quick but don't hurry. Mersedes is not the panicking kind. The oldest of five children, she has a father fresh back from a tour of duty in Iraq and a mom who leaves for a bakery job early every morning. She took care of her brothers and sisters while her father was away and sometimes slips and calls them her kids. Among her claims to fame: "I can fix four lunches in ten minutes with my eyes closed." From the ground, I can see that her face is blank and she's calm, making her way over to the cable to clip in like it's nothing to worry about. Mersedes (above). Her father recently reenlisted for another three-year tour of duty, and she'll go back to taking care of her four siblings, but for a week she gets to be just a kid. That includes getting out on the lake, rock climbing, and, of course, campfire high jinks. ON HIS WAY TO THIS Operation Purple camp ("OPC" in the acronym-friendly military atmosphere), Bryce told his mom that his ultimate camping experience would be to swim across a lake to an island that could only be infiltrated by scaling a sheer cliff. Reaching the top, he would climb into a tree house to sleep. Over the course of a week at the camp, Bryce will swim in a lake, rock climb, and hang 35 feet in the air on the ropes course. He will sleep, however, in a military-style modular general-purpose tent system (MGPTS) big enough to house all the male campers. Thirteen years old, Bryce has braces, a body poised for another growth spurt, and short hair that shines red in the sun. He favors dark sunglasses that give him a RoboCop look. His first day at camp is marked by wiggle-o, a game that requires players to dance in the center of a circle of people and yell, "My hands are high, my feet are low, and this is how I wiggle-o!" When Bryce's turn comes, he might as well be facing a firing squad. "My hands are low, my feet are ..." he starts. "No!" The others in the circle correct him. "Your hands are high; your feet are low." Bryce presses his hands to his thighs. "But my hands are also low," he insists. In March, Bryce's dad was sent to Afghanistan with two weeks' notice. A National Guardsman, he had recently switched jobs so he could spend more time with his family. They had a whole summer of fishing and camping trips planned when news of the deployment came. After his dad left, Bryce quit trying in school. Now it looks like he might end up spending the rest of summer vacation in summer school. That doesn't bother him, he says, because what else would he be doing? At Operation Purple camps, the intrinsic goofiness of summer camp is shadowed by shared sacrifice. The kids at upper left are Bryce, left, and William. LAST SUMMER NEARLY 10,000 KIDS nationwide participated in one of 100 weeklong Operation Purple camps, run by the National Military Family Association (with partial financial support from the Sierra Club). This session takes place at a fairgrounds near Bend, Oregon, in a cluster of large tents that resembles a mobile command center. It's not basic training, but attention to discipline is part of the program. Camp director Ethan "Tsuga" Erickson, a seven-year Army veteran, compares it with the military expectation of keeping your weapon clean, only here "it's wearing your name tag and not rolling around on the floor during dinner." 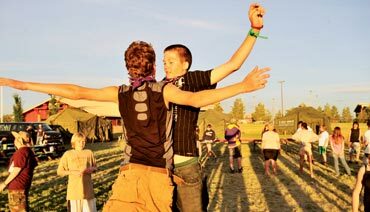 Most of the kids at camp this week have parents in the U.S. Army Reserve or National Guard--salespeople and teachers who signed up for a little extra cash and ended up overseas, says Joan Engeldinger, Oregon State University's 4-H military liaison. Their spouses suddenly become single parents for a year at a time. Divorce rates are skyrocketing, and as public support for the wars wanes, military families can feel ostracized, especially in left-leaning Oregon. The kids have to deal with the powerlessness of having a parent in danger on the other side of the world, help raise younger siblings, and live with a mom or dad who can be just as scared and stressed as they are. Camp is a break from all that and a chance for the kids to learn ways of coping with their feelings, says Erickson. It's no accident that the emotionally charged "Wall of Honor," where kids stand to share a picture of their mom or dad, comes just before the high-energy, audience-participation campfire songs. "Give them a chance to laugh it out instead of having to sit there and cry," Erickson says. Monday's Wall of Honor starts with William, 12. Perpetually smiling but notably quiet, he stands in front of the white plywood bandstand that serves as a stage for the skits, songs, and jokes that end each night's campfire session. "My mom was in the Army," William says. "She spent 18 months in Iraq, 200 miles south of Baghdad. She was hit twice by roadside bombs, and she said that at night all she could hear were mortars and gunfire." This is William's third year at camp. He shares his story easily, and in the fading light the kids slow down for the first time all day. One girl shows a photo of her dad in uniform. "This is one of the only pictures of him smiling," she says. "But he's really cool." Another girl stands with her father's picture. "He won't tell me what happened in Iraq," she says. "He says he doesn't want me to know everything that happened." She pauses, trying to think how to finish. "I don't know what I would do without him." TUESDAY MORNING, 12 red helmets bob down the trail toward the cliffs at Smith Rock State Park, a swath of volcanic formations hugging a kink in the Crooked River. It's famous for being the birthplace of modern sport climbing. Bryce leads the group. As he scales the rock, Mersedes, her new friend Lizzie, age 14, and the constantly moving Cassandra, age 12, start a conversation with the instructor, National Guardsman Specialist Galen Coombs. "What do you do?" Lizzie asks. Lizzie says her dad was in Afghanistan. "That's where I wanted to go, Afghanistan. That's where I still want to go," Coombs says. He's a rock climber, it turns out, and Afghanistan has lots of mountains. Lizzie tells him about the time a suicide bomber blew up someone with her dad's name. "We were so scared," she says. "And then Dad called us, and we were like, 'What?' And he said, 'Yeah, that was one of my friends.' He just got back last year." "My dad's going back for a year," says Cassandra. Mersedes is intent on topping them both: "My dad's going back for three years. My dad's been living in Iraq." Cassandra stops hopping on the rocks. "I feel so bad for you," she says. "I couldn't stand going that long without seeing my dad." IN PITCH-BLACK DARKNESS, Mersedes complains of stomach pain. It's Wednesday, and we're on an underground hike a mile into a cave south of the camp. She hangs back and leans on the wall when the group stops. The cave narrows steadily, requiring the hikers to go from walking to crouching to crawling. But the end of this shrinking cavern has gained a mystique among the kids and seems to have settled Mersedes' stomach, or at least provided a temporary distraction. When her group stops to separate between those willing to crawl and those not, she continues scooting into the darkness. The campers emerge from the cave tired and cranky. Around every corner, there's a squabble. Someone took someone's seat at the birds-of-prey show, someone else is being slow, and they didn't have enough time to eat lunch. Things continue to unravel as I chat with William outside the boys' tent. His mom wasn't supposed to be redeployed, he says, but the squad came up short, and they put two names in a bucket and drew hers. She just got back a few months ago. He's telling me about his passion for the violin and about the Bible he carries in his pocket when someone throws a smelly sock, someone pushes back, and soon Erickson arrives to address the situation. "Play fighting becomes real fighting very quickly," he says to the group. "You see the numbers on your name tags? That's your squad, but when you're in the tent, you're a platoon. Think about your parents, who have to work together to accomplish a mission. What happens if one of the squads is causing problems for another squad?" Things stay emotional as the sun fades into the mountains and the dry evening wind picks up. It's Wall of Honor time, and you can almost feel Darin's throat tighten as he holds up a picture of his father in uniform. "This is my dad," he says, then stops. Darin is 14, tall, athletic, and popular. When talk of who is dating whom starts to creep between the boys' and girls' tents, Darin's name is the first to come up. But now he's in front of the group, struggling to go on. He lifts his eyes to look at the silent campers, and the feeling of the moment is that simply staying up there and trying to finish his sentence makes him a stud. "The last time I saw him was two months ago." More silence. "I don't get to see him very much." His words cut through all of the afternoon's distractions. Erickson dispatches someone for tissues. To lighten the mood, two counselors stage a Britney Spears-versus-Backstreet Boys a cappella karaoke competition. It takes a while for the sniffles to turn into laughs, but by the end the kids start to come back. A few skits later, I go onstage for a pie-eating competition that ends with my face buried in whipped cream. It may just be that I'm up in front of everyone, but the laughter sounds a lot louder than usual. THE NEXT MORNING, the Idaho Red Devil is on everyone's mind. It's half cat, half man, and you wouldn't want to meet it in the dark on the way back to your tent. Thursday is also short-shorts day for the guys: Everyone's rolling his shorts up to mid-thigh and bugging me to do the same. I decline, citing journalistic detachment. Besides, last night's ghost story was scary enough. Expectations for the final day of camp are high. A shaded hike through the trees along the Metolius River and an afternoon swim at Scout Lake don't require anyone to face a fear of heights or brave a dark cave. General enthusiasm is tempered only by exhaustion. At lunch I sit with Bryce while negotiations for food swaps fly between tables. We talk about school. "I can do the work," he says. "It's a matter of actually doing it and turning it in." "That's the same thing with me," interjects someone leveraging for cookies. And summer school? "I'm going to end up there, yeah," Bryce says. He might have gone further, but he's interrupted by his fellow campers. Bryce reluctantly removes one dark lens from his sunglasses. "You have to say arrrgh!" they say. "I'm not saying arrrgh," Bryce says. "Aw, c'mon," one kid pleads. "Say arrrgh. Say arrrgh, c'mon, just say it, say it. C'mon, please? Say it?" This kid has acquired both a sugar cookie and barbecue chips, and his negotiating method is just as effective on Bryce. "Arrrgh!" Bryce roars, in a full-throated declaration of space piracy. Afterward, he shrugs off more questions. "I don't feel very concerned about summer school right now," he says. THE ONLY SERIOUS BUSINESS today is a post-lunch brainstorming session with mental-health counselor Mike "Beav" Beaver on how military kids are different from civilian kids. Everyone is producing similar lists when Lizzie points out one stark difference no one else had mentioned. "My dad showed me a video of a suicide bomber, and you saw pieces of him and everything," she says. On the list it goes down as "experience war differently." "I hate seeing stuff like that," a kid named Tanner says. "Even if they're trying to kill our dads, everyone has a family. Whether they were a terrorist or not, you feel sad that they died." Mersedes agrees. "I don't feel like we have a place to be saying that they're wrong and we're right even if they want to kill us." A camper named Keenan chimes in: "Yeah, like, who is to say who is right or wrong?" "Everyone has their own reasons," says Mersedes. "Their families didn't say, 'Go be terrorists.' They were probably forced into it." And then it's time to swim. The counselors have floated two logs into the middle of the lake for everyone to jump off, and inflatable toys take shape on the shore. After a few hours, the kids board buses and head back to the camp for one last round of activities. They eat dinner and write cards to soldiers. "You guys rock! Thanks for your survice!" Then comes a square dance. As soon as it starts, Mersedes complains that her stomach is hurting again. Other campers line up with partners and learn the steps. Erickson's voice goes out over a makeshift PA system. "Everybody do-si-do! Everybody with a right-hand swing!" The golden hours have arrived, and long shadows flicker on the grass. The mandolin melds with the guitar, a tambourine keeps time, and--this is hard to believe--a rainbow actually stretches between Mt. Bachelor and the Three Sisters, framing the whole scene. Bryce stamps his foot and claps while Darin chest-bumps instead of do-si-do-ing. Then Mersedes returns to the group and, stomachache or not, she can really dance. Beaver comes over and tells me about the early years of Operation Purple, when he had more counseling duties than he could handle. This year he's only had one issue to deal with all week. He attributes the change to more-capable and sensitive counselors and staff and the fact that the nation's been at war for six years, nearly half of these campers' lives. They're just getting better at dealing with it. "You should have done this story three years ago," he says. As the kids dance, a cold front is colliding with a warm front that will bring thunderstorms. But right now, on the last night of camp, the clouds are stacking up, and it looks like it's going to be a beautiful sunset. Peter Frick-Wright is a freelance writer living in Portland, Oregon. 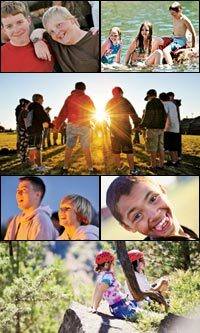 Operation Purple camps are supported by the Sierra Club's Military Family Outdoor Initiative. This article was made possible by the Club's Building Bridges to the Outdoors program. Photography by Chris Mather & Mike Houska/Dogleg Studio; used with permission.